An Aboriginal Second World War soldier has been commemorated. 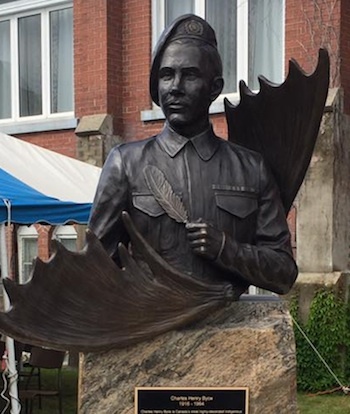 A monument dedicated to Charles Henry Byce, the most decorated First Nations veteran of WWII, was unveiled Sept. 18 at the Royal Canadian Legion in Chapleau, Ont., Byce’s birth-town. Sculptor Tyler Fauvelle was present for the unveiling, giving a short speech, and sharing his insight into the heroic life of Byce. “I came across the remarkable story of Charlie Byce while doing research on the contributions of Indigenous people to Canadian war history… Around that time Byce was not known and required much broader recognition,” said Fauvelle. According to Fauvelle, Byce’s father, Harry Byce, was a non-Aboriginal First World War veteran. He actually received the same honors as his son, Charles—both the Distinguished Conduct Medal (DCM), and the Military Medal—which is the only time in Canadian history a father and son received the same prestigious awards across two different wars. Byce’s mother was a Cree woman from Moose Factory, Ont. When she married Harry Byce, she lost her Indian status, said Fauvelle. As far as Byce’s experiences in Indian residential school, he was subject to the same poor treatment many Indigenous people received. Hi feet froze completely once, to the point of him being unable to walk, just before leaving for Christmas break. “What’s interesting is, even after suffering that abuse, when it came to war, Byce proudly answered the call to fight for civilization. When he was serving, of everyone surviving from his regiment, all said anyone alive was alive because of him,” said Fauvelle. Byce’s most remembered act of heroism happened during the end of the war, and it’s the one Fauvelle was most inspired by while creating the Byce monument. “It was the last major line of defence, south of the Hochwald Forest Sector,” said Fauvelle. “In this battle, he was given the DCM for extreme bravery. Basically, during that battle the German tanks were approaching. All the tanks for Lake Superior were destroyed and there was less than 16 of them left alive. All the commissioned officers of C-company were dead, and at this point Charlie was in charge,” he said. What happened next was like something out of a movie, according to Fauvelle. Byce single-handedly destroyed an encroaching German tank—with no major weapons available—then gathered his comrades, including a long-time friend nicknamed Popeye, bringing them to safety, while still surrounded by the Germans. “The sculpture is the story of a hero,” said Fauvelle. “But the other story I was trying to show was the story of his Moose Cree heritage. So antlers encircle him, but they’re broken antlers… They’re a symbol of what racism and residential school did to separate him from his culture,” he said. “He’s also holding an Eagle feather close to his heart… It’s a tribute to a deeply brave man and a reminder that Charlie Byce, son of a proud Cree woman and a World War I hero, never forgot who he was,” Fauvelle said. Roger Chum, president of the Ontario Native Education Counselling Association (ONECA), was part of the planning committee for the Byce monument project. It was Fauvelle who came to him with the idea, along with a few other members of the committee, and Chum and ONECA took the project on. One of the mandates for the project, in order to receive funding from the government, was to ensure it was used as an educational tool, said Chum. Chum is from the same community as Byce’s mother. He had already heard of Byce when Fauvelle approached him, because he had once read a book called “Native Veterans” which included information on Byce. Chum was happy to be part of the project, and sees value in sharing Byce’s story, but notes it’s not just the story of an Aboriginal veteran’s acts of heroism. Byce’s story can (and will) also be used to show what Aboriginal soldiers came home to after the war. “Their story of challenges with the government put them right back to second class… They were fighting on the battlefield with their non-Native brothers, and then when they come back to Canada they’re treated as the same Indian as before the war,” said Chum. “I think our hopes and aspirations for this project is it will provide awareness among our non-Native brothers and sisters. As you know, we served under the Canadian flag and made the sacrifices, and I hope it will further the reconciliation process that Canada and our First Nation people are calling for,” he said. Roger Chum, president of the Ontario Native Education Counselling Association, (black shirt holding the black portfolio) and sculptor Tyler Fauvelle (in the front with glasses, tie and white shirt and suit) attend the unveiling of the monument to Second World War hero Charles Henry Byce on Sept. 18.